Last time I wrote about Normal and Reverse Breathing. 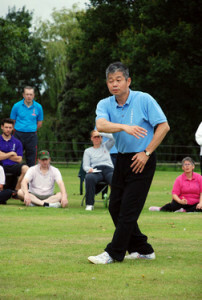 However in Qigong practice it is better to breathe naturally. This is because our body will always find the “way” how to breathe in order to make us relax and feel comfortable. Breathing is important, but relaxation is more important. Without relaxation in our movements and meditation our breathing can become too strong as it is forced by us. This will cause discomfort and it is not natural. Sometime we can make the Qi go too fast or create too much heat in the body, so we must breathe naturally and then we will never have a problem when we practise our Qigong. Of course, when we move up, most of the time we will breathe in and when we move down, most of the time we will breathe out. When we open we will usually breathe in and when we close we usually breathe out. This happens most of the time, but sometimes our breathing will be opposite. So we are better relaxing and breathing naturally to let the body find the best way to breathe. One thing we must remember though, is breathe in and out through the nose and not with the mouth, this is natural too.